This summer, I visited the island of Okinawa and was immediately drawn to the pristine beaches and stunning underwater creatures. It was a feast for the eyes and the soul, and the Okinawa cuisine made an equally idyllic impact on my taste buds. Okinawa food possesses a rich history and taste that is wholly unique to the island, one that must be tried to be believed. 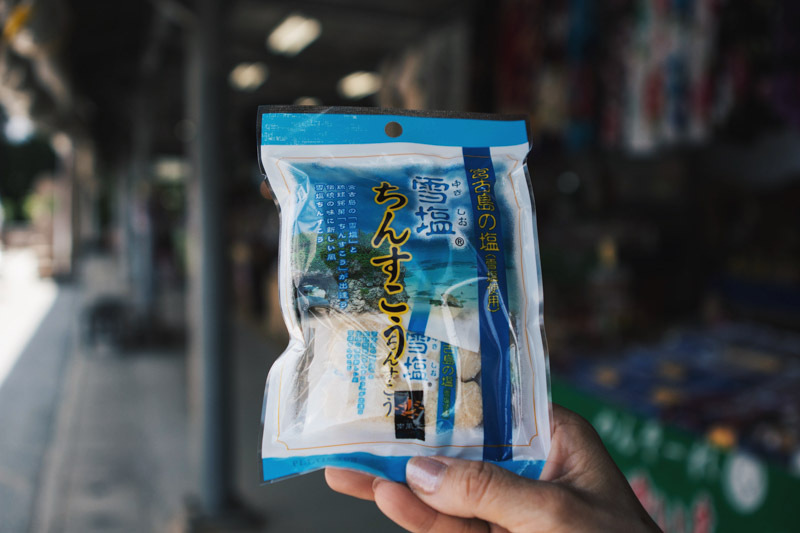 Travelling down from Nago to Naha gave me a chance to try out some of the most exotic food in Okinawa, as well as those that can be easily found on the streets. You can’t claim to be a true Japanese foodie if you haven’t tried what the Okinawans have to offer. 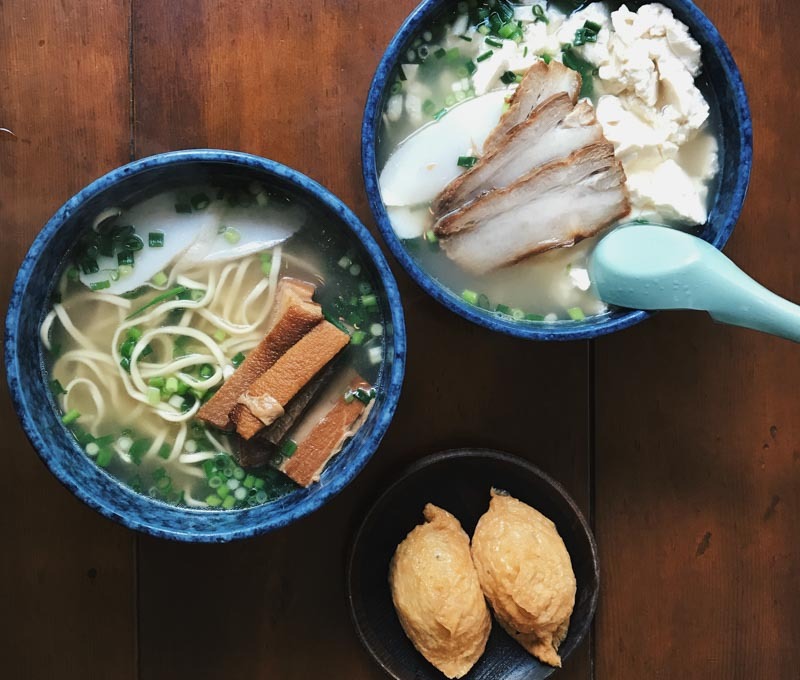 Here’s a list of the 11 most interesting must-eats in Okinawa to surprise your senses! 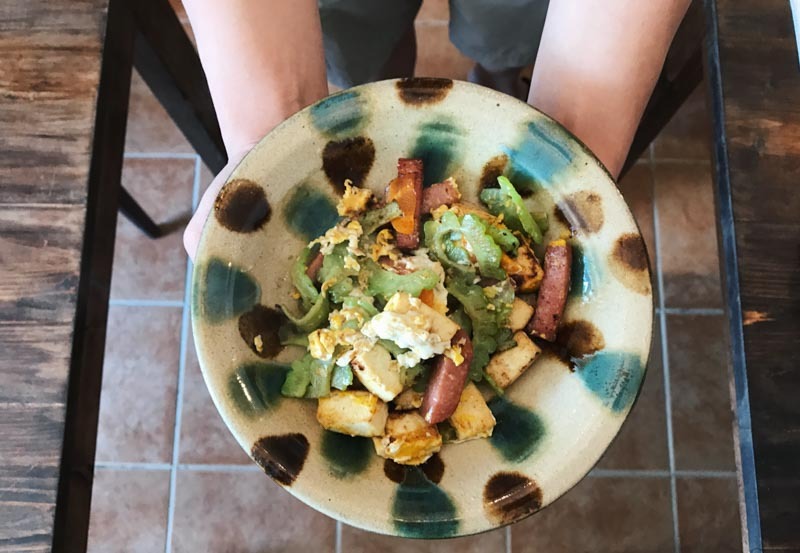 This dish is the Okinawans’ go-to “zi char” dish that is usually served with rice. A champuru (mixed together) is a combination of Japanese bitter melon (goya), egg, tofu, other vegetables and Spam. Contrary to popular belief that bitter melon dishes are always a no-go, this dish was a surprise with its slightly charred flavour that enhanced the unique pairing of Spam and goya. 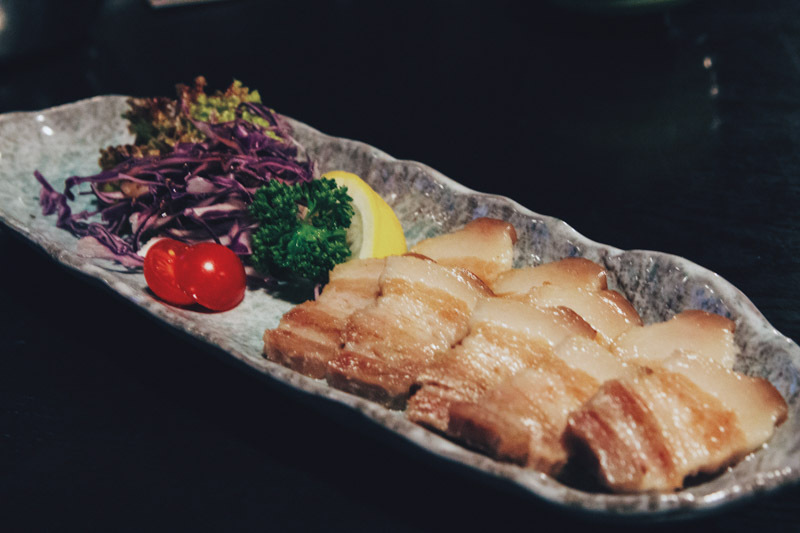 A classic Okinawan dish is Rafute – braised pork belly cooked with awamori, a traditional Japanese rice liquor. Braised to a soft tenderness and then thinly sliced, the meat melts in your mouth with one bite and makes an ideal beer snack. I especially loved how it was well-salted and eaten as an appetiser or a snack rather than as a full meal. You definitely can’t give this a miss if you’re a meat lover in Okinawa! While this dish may look like any other bowl of Japanese udon, Okinawa Soba is distinctively different as it is the only soba noodle that is made from 100% wheat flour, making it much chewier and thicker than the rest. It is typically served in a bowl of smoked bonito broth that is lighter on the palate with a clean after taste. Along with seaweed and pickled ginger, the Okinawans definitely love their soba with spareribs or three-layered pork. As I like having my food on the saltier side, the Okinawa Soba was definitely suited to my taste buds. Okinawa is surrounded by the ocean, which often leads to the common misconception that the island is abundant with sashimi and sushi. 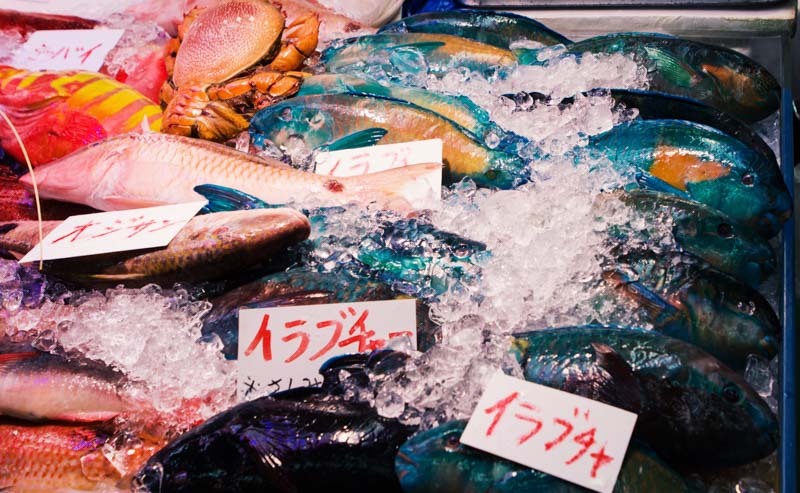 Okinawa is, in fact, more well-known for its incredible cuts and variety of beef and pork. 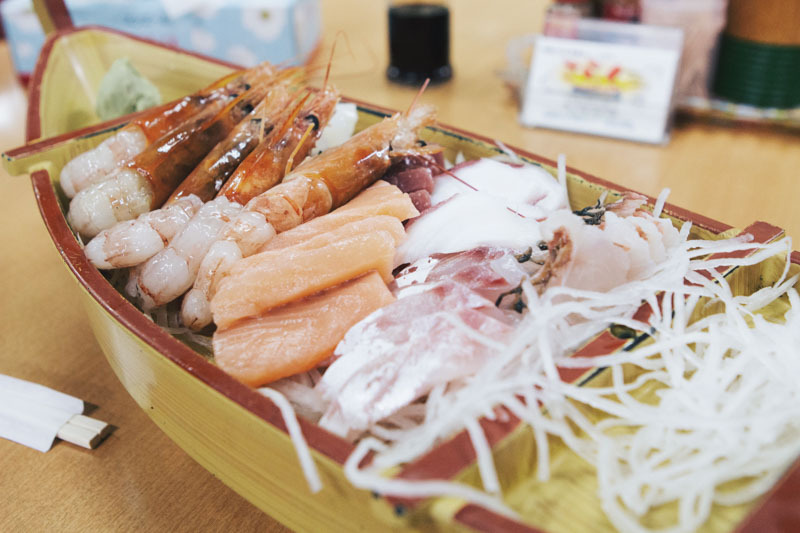 Hence, most of the sashimi and fresh fish can only be found in Makishi Public Market in Naha, Okinawa. Though it’s rather touristy and slightly more pricey, the seafood selection will surprise you with its unique variety of fish and seafood. You can easily purchase your fresh seafood from the fishmongers, which will then be prepared by the restaurants. I especially loved the sashimi which was such a steal and would be the main reason why I’d come back again. 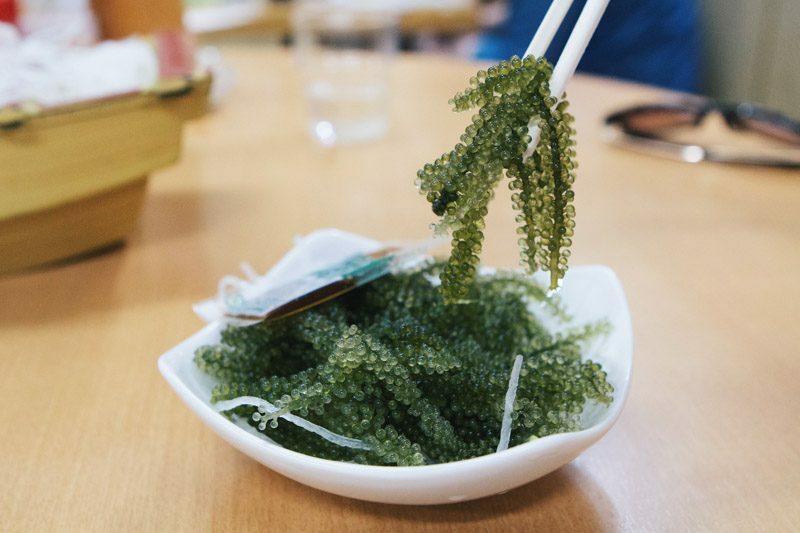 This local speciality seaweed in Okinawa, otherwise known as Umi Budo (sea grape) is referred to as green caviar. These shiny green bubbly fronds, usually eaten with soy sauce or vinegar, can be easily found in any souvenir shops or public markets. Try a few at once and you would be hooked onto its addictive texture and slightly salty flavour that pops in your mouth. If you’re afraid of it having a very strong fishy flavour, try it with rice or as a garnish with your sashimi to savour this seafood delicacy. You definitely can’t give this locally brewed beer a miss. The brewery uses local water as well as German Hallertaurer hops and European and Australian malts to craft the beers. 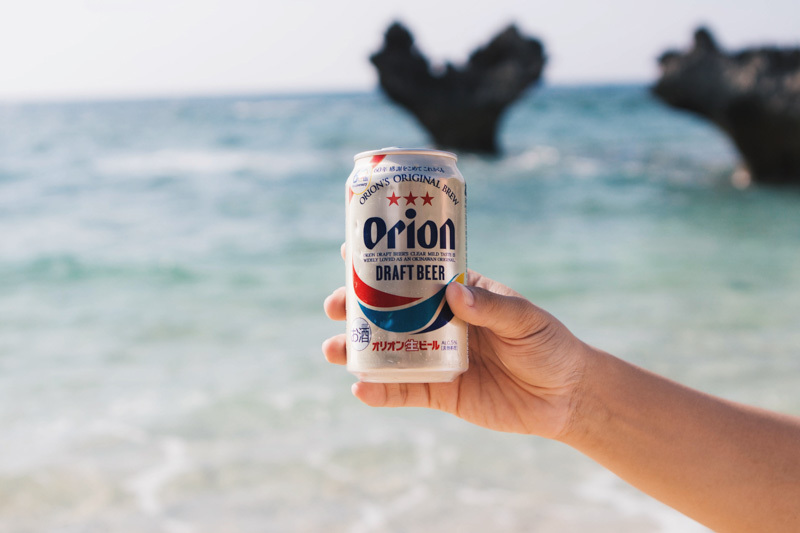 Easily found in convenience stores and in almost every restaurant, it makes for the perfect booze to go with your meals or to just chill out and enjoy on the beach. I really enjoyed this brew as it was slightly fizzy at first but came with a clean aftertaste. It was crisp, refreshing, mild and fully-flavoured. If you prefer a stronger brew though, this might not do it for you. Still, no harm trying! 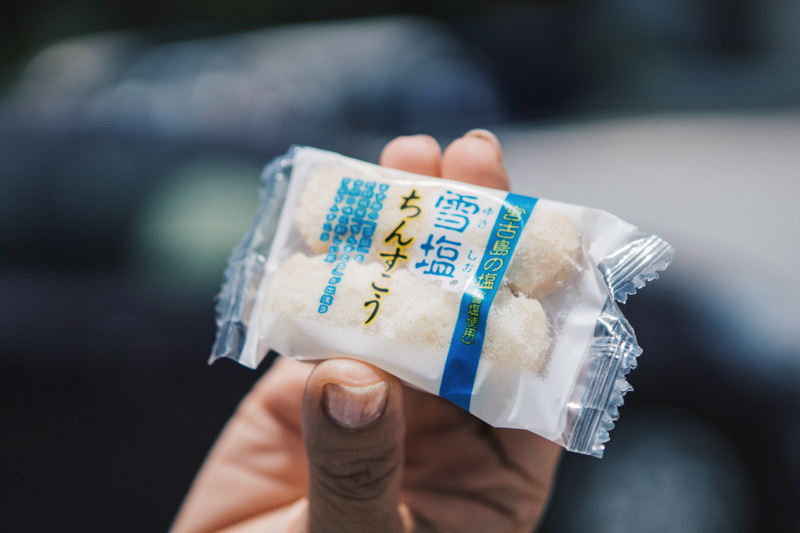 A traditional Okinawan cookie made with salt from Chatan is a popular go-to snack here in Okinawa that can be found at street side stalls. The saltiness of the cookie complements the buttery flavour really well. It is a good afternoon snack to have under the sweltering heat and a favourite if you love butter cookie and all things savoury. 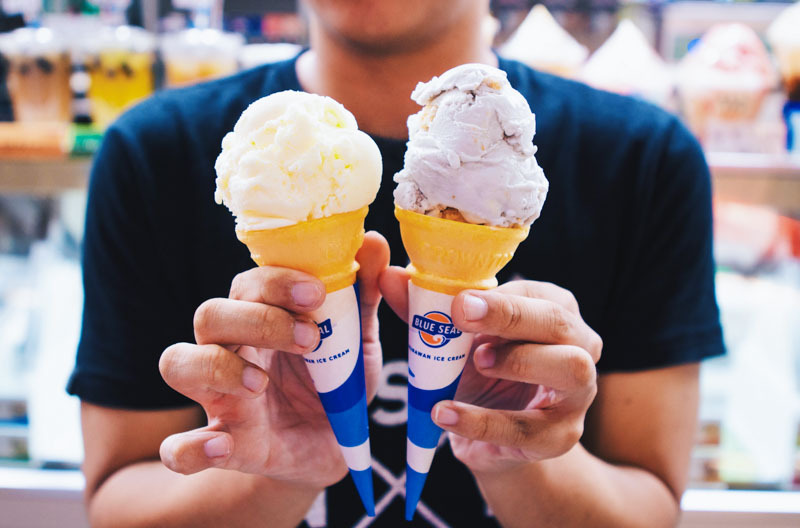 Blue Seal is a speciality ice cream brand that was born in America and raised in Okinawa. Found in almost every corner of Okinawa, it’s the locals favourite joint for desserts. We tried the Okinawa-exclusive flavours, including Shiiquasa Sherbet that comes with a mix of yuzu and lime, and the Okinawa Ta-imo Cheesecake that comes with a slight saltiness that enhanced the milky cheesecake flavour. There are more than 30 flavours for you to try, so definitely swing by for a taste. 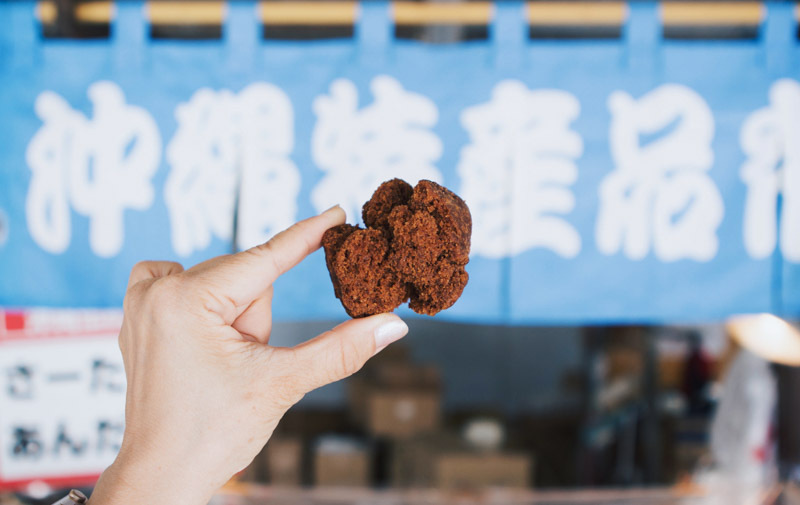 Made from Okinawa Brown Sugar, Santa Andagi is a fried brown sugar doughnut that can only be found in Okinawa. Easily available at street side stalls, this handmade dessert is made with wheat flour, sugar, milk and egg yolk — crisp on the outside and soft on the inside. Its taste and texture are very different from normal doughnuts with it being less sweet and more biscuit-like in texture. It is definitely worth trying as Okinawa’s brown sugar is said to be the best of the lot! Sweet potato is another local Okinawan speciality. Slightly different from the ones that we’re used to, the Okinawa sweet potato’s flesh is purple in colour and less starchy. 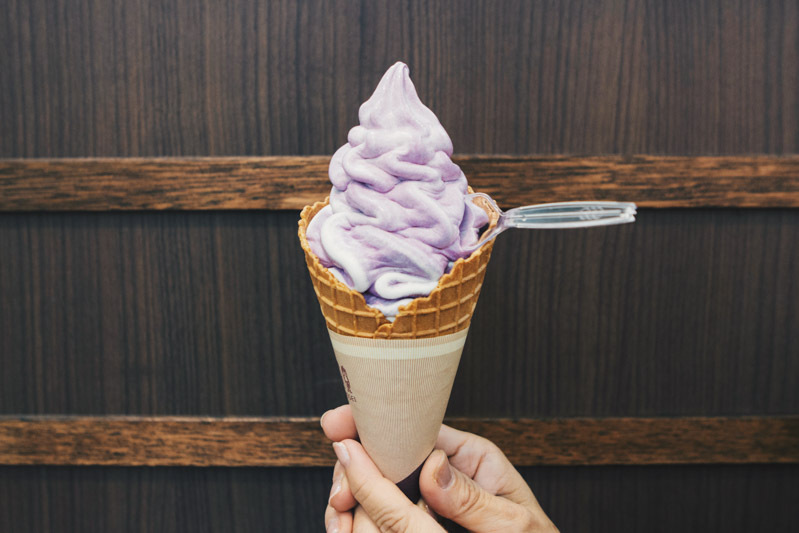 I couldn’t stop indulging in the steamed sweet potato as a snack in Okinawa, but the Sweet Potato Soft Serve is even more addictive. The milkiness of the vanilla soft serve paired really well with the freshly made sweet potato paste. I loved how the ice cream tasted fresh and not artificial, with an added creaminess to it. It comes in a huge cone which really justifies its price. 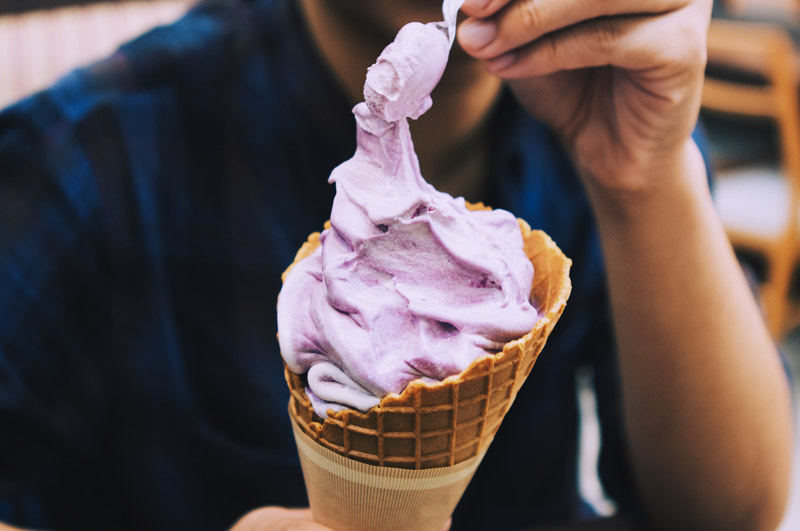 Last but not least, Okinawa is probably the only place where you can find Salt Ice Cream. 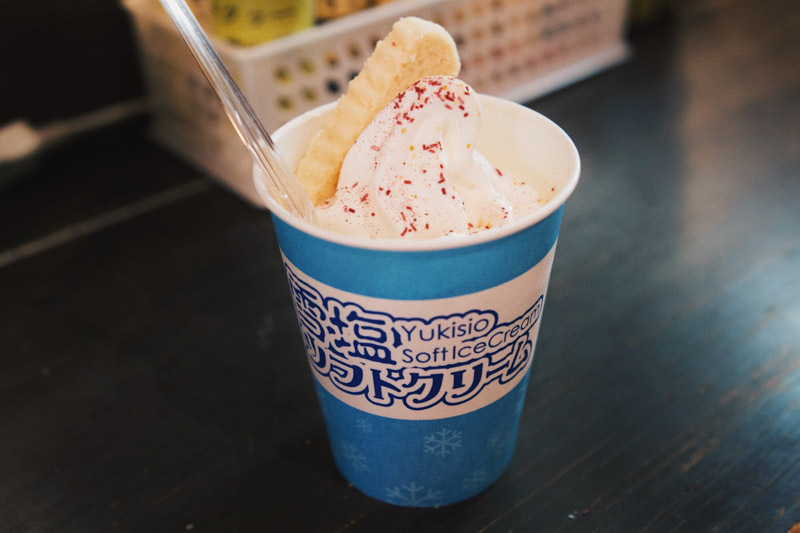 The strong punch of the Okinawa salt crystals really enhanced the vanilla flavour of this light and lovely soft serve. It comes with an additional complimentary topping of flavoured salt — must-tries are the hibiscus and matcha varieties. Do get ready for a salt explosion in your mouth if you have it all at one go! Only fully-functioning after I've got my daily dose of caffeine & milo.